I first learned of Anne Graham Lotz’s latest book through her own tweet: “I have decided to break the silence,” she wrote on Twitter. 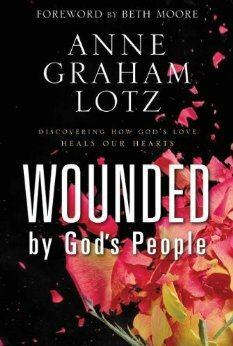 “Wounded by God’s People.” I immediately ordered an early copy, hopeful that Wounded by God’s People would be a ground-breaking publication, confronting the Church community on its treatment of women in ministry and leadership, and possibly even some of the other groups so heavily oppressed by conservative Christianity. 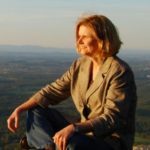 Having been an active Southern Baptist woman until just two years ago, I was entrenched in those Church-inflicted wounds, and I knew enough of Lotz’s story to anticipate some of hers. Anne Graham Lotz is the daughter of evangelist Billy Graham and has her own evangelistic ministry, AnGeL Ministries, based in Raleigh, North Carolina. Several years ago, in an article for the Washington Post, she said that if some Christians had a problem with God’s calling her to preach “they should take it up with Him.” Here is a video where she also talks about this. I expected her to continue in that vein in this book. Unlike what I had imagined, though, this new book by Anne Graham Lotz is essentially a call to healing through forgiveness, especially of other Christians who have hurt us. Written in a style of personal story-telling with Scriptural stories and personal applications ever in the forefront, Wounded is comparable to the writings of Max Lucado or Beth Moore, with Moore actually having written the foreword. Somewhat like an extended Sunday School lesson, Wounded extracts pre-chosen present-day morals from the details of the biblical stories and challenges readers to forgive those who have caused pain, acknowledge their own sins, and turn or return to God. I wonder if the idea for this book might have begun with the intention of confronting the Church, then gradually retreated to a safer evangelical and ministerial place. I wonder if the “more severe” unshared wounds Lotz mentions in the epilogue were originally the inspiration for the writing, but were later left out to avoid causing more pain to those involved. Or perhaps it was just my own personal wounds hoping she was going to give them voice. Either way, the book does not go where I expected, but stays safely within its conservative evangelical boundaries, not primarily to confront the wounding Church, but to heal the wounded reader. It is a call to those who have been hurt by “God’s people” to return to God, not confusing imperfect Christians with the perfect loving God. Gandhi famously made the same distinction about Christ and Christians. Based primarily on the Old Testament story of Abraham’s servant Hagar, Wounded’s Biblical references are the glue that holds the book together, from Rahab to Hannah to Jonah to Elijah, to the vine and the branches, wilderness times, and— most powerfully interspersed throughout the book— the wounds of Jesus, from those imposed constantly by the religious leaders of his time, to his crucifixion, to how he reacted to those who wounded him. Lotz shares personal hurts, such as when her husband, a deacon and Sunday school teacher, was voted out of his leadership positions by their church for teaching from a biblical inerrancy position; and the time when she was a teenager and a woman at church confronted Anne’s mother about Anne’s hair color, make-up, and hat. She also tells of times when she has unintentionally been the wounder of others; but no mention of the pain that must come from watching what her brother has done to their father’s ministry organization or how he is using their father’s name to push politics their father would never have embraced; or to the wound of being cancelled after accepting a Baptist convention speaking invitation because of the controversy over whether a woman should be allowed to speak before men; or the time she was invited to speak to 800 pastors, and many of them responded by turning their backs to her as she spoke. Despite Billy Graham’s calling her “the best preacher in the family,” she is indeed a woman, and thus, in certain “Christian” circles, not suitable to wear the “preacher” label, no matter her gifts, her background, or the spiritual depth of her heart. While Lotz briefly mentions several specific possible reader wounds, including divisive church politics, mistreatment to ministers, divorce, and dealing with abortion in one’s past, as well as generalizing enough to include whatever pain the reader might be experiencing, it was probably too much to hope that she might directly address the oppressive wounds the Church has inflicted upon women, gay people, and those Christians who dare to think and question outside the conservative evangelical parameters. This is not that book. Also not meant as a scholarly publication but as a balm for wounded hearts, Lotz’s examination of the Biblical narrative of Hagar doesn’t question complex Old Testament issues like slavery or the culture of polygamy and concubines. Some examinations, however, like that of Isaac and Ishmael together burying their father Abraham (Gen. 25:9), are quite thought-provoking. A fast and easy read, filled with stories both personal and biblical, Wounded by God’s People is a good addition to any conservative evangelical bookshelf. Presented as a ministry to the reader, reaching into whatever suffering she or he might be encountering, it is a book that can bring healing to many readers within the conservative evangelical community.